Be sure to watch the trailer in HD, not the crappy video embedded in the page. 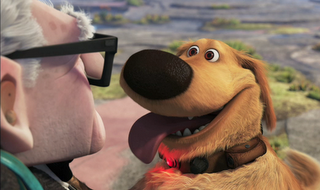 I didn't work on Up (but for one measly shot) but it's looking great and I can't wait to see it! Definitely very original. If previous teasers and trailers didn't make you want to see it, I think this one will. To say that I'm looking forward to this is a complete understatement. May 29th can't come soon enough! I have to agree with Mitch, words can't describe how cool this looks. will there be a spin off of mini adventures? lol my word verification was "UPERS"
I have been excited to see this one since the first trailer.. It really looks charming. lol, I love the characters and care for them already and it's only the trailers! Yeah the first trailer did'nt really grab me but this new one did, that dog is Freaking hilarious!